join the e-mail list to get the latest updates and special deals. 7:30 pm: Swing Dance Lesson. 8:30 pm – 10:30 pm: Dance. $10 includes lesson, dance, water, and snacks. All Ages, no partner needed. Fun, progressive classes that will get you on the dance floor. 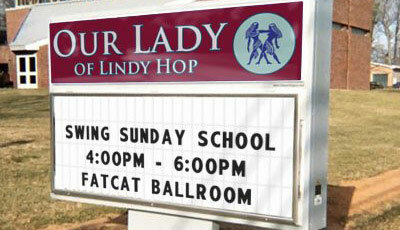 $15 per class, all ages, no partner needed. 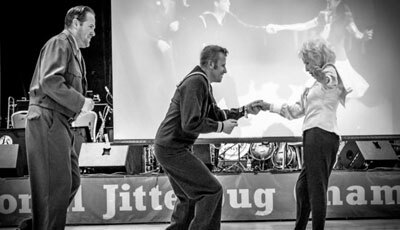 NEW progressive classes in East Coast Swing and Lindy Hop! Join the Arizona Lindy Hop Society for some exciting classes that will have you on the dance floor feeling more confident and having fun. We will be exploring creativity, musicality, improvisation, and new, socially lead-able and follow-able moves. 8:30 pm – 10:30 pm: Dance to Swing DJs or Live Swing Bands. $10 at door - includes dance lesson, dance, water, and snacks. Join us for a 7 day Caribbean Cruise aboard the Carnival Conquest while dancing our way to paradise! 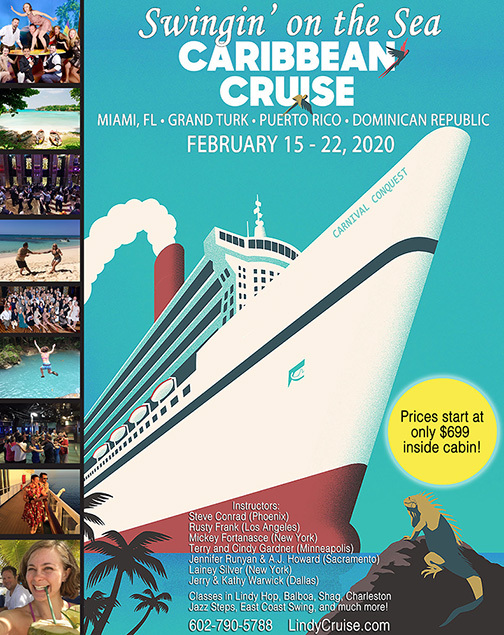 We leave from Miami, FL (come in early for dances in Miami) and head to the warm beaches and crystal clear waters of the Eastern exotic Caribbean to visit the exotic ports of Grand Turk; St. Thomas, US Virgin Islands; San Juan, Puerto Rico; and Angel Cove, Dominican Republic!. Classes while at sea and dances every night!